It's GIVEAWAY DAY!!! WAHOO!! I LOVE a GIVEAWAY! 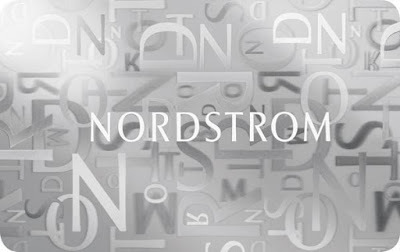 TWO $100 NORDSTROM GIFT CARDS! One for YOU, the winner, and one for you to share with a friend. See the Rafflecopter below for ways to enter to win. The contest will close at 12:00 a.m. on Wednesday. We'll announce the winner on Thursday, the 29th. I've been boycotting shorts because I'm over them, BUT the weather could care less. I'm the only one suffering in my jeans. ha! Z Supply Tee (I have both a small and an extra small. The small requires a cami underneath because it's so low. The extra small doesn't. This comes in camo, but I wouldn't recommend the camo. After one wash, the camo is pretty see-through. Enter the Rafflecopter below to win! Good luck, ladies! BRING IT ON, FALL! We're ready for you! Love all of the clothes! LOVE all of your fall fashion here- I picked up a military vest and I am so excited to start wearing it! Love this post but what did you think about the Big Brother Finale???? Eek!! Fall is my jam! I'm loving the off the shoulder tops this year!! Excited for this giveaway! Thank you for doing this. Hope I win!! I am so ready for Fall, too!!! Bring on the cool nights and blankets! Who couldn't use something fun for the fall from Nordstrom? Love your picks! 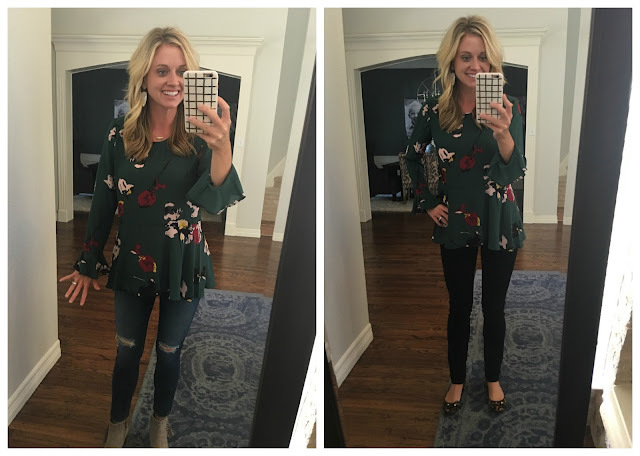 I love the floral green top with the flare sleeves! Dreaming of fall clothing as well! The see through, white top, plaid tops, and the sheer, white top are my faves in the post. All look great on you, too! Fun giveaway! I saw next week that Houston is getting a "cold front" - all the way down to highs in the mid 80s. I'll take it! C'mon fall! Love Love love that gray long sweater! Love your style! I am ready to pick up a few new pieces for fall! I just got a gorgeous military green vest that I'm dying to wear but it's too hot right now! And I'm with you on boycotting certain clothes! I wore a thin sweater to school the other day and just kept my classroom cooler haha! Love it! Booties are my favorite shoes ever, so much so I bought a pair for my 10 year old. Mad about plaid too, I bought plaid to match my baseball team that is headed to the playoffs! Haha! Love all of the fall clothes! I have been eyeing some booties. Would love to win a gift card to purchase a pair! Love your style! Great suggestions! There are so many cute tops! I'm with you on the weather. :( I'm over the 90's in September. I love what you've picked out for fall though. Super cute! Oh how I would love to win this, so thanks for offering it to us! What a fun first day of fall! I am loving the mustard top, so much that I think I need it! I hope I win! I could use a few fall things!! We need Fall to hit DFW....pronto! I'm with you and over all my shorts and T shirts!! I need boots, jeans and fall tops! We aren't seeing any fall weather in MO yet, either! Love your picks, especially that white mesh sweater. It just look great on! I'm so ready for fall in Texas! I love that plaid top from JCrew, the colors are terrific. You look great in all of these outfits! Loving the mustard colored top and the football top! Thanks for hosting this giveaway! I love the plaid vest! Love the plaid tops you picked! I'm bummed the floral print peplum blouse is out in my size- it would have been perfect for family photos coming up! Thanks for the giveaway, you look great in all of this! Love Nordstrom!! All of those tops are so cute! Hope I win! I love Norsteom!! Love the lush tops too with jeans! I hope I win!! I haven't watched yet!! The Shills got back last night so we were at the airport! I'll let you know! Love all of the flannel tops at Nordstrom! The best! Thanks for the option for a giveaway!! I love all the picks, but especially the MK vest!!! Would love to win the Nordstorn gift card and do some Fall shopping! This is getting me excited for fall weather!!! Eek! Love Nordstrom! Thanks for the giveaway! Loving all of these fall styles! Now come on fall weather!! I love that vest from KenLeeCait! Thanks for sharing! I've been praying for some cooler weather down here in Houston! Love your style. So cute! Woohoo!! So excited for Fall! Great giveaway!! Love the plaids, always great for fall. I love that mustard yellow top!! Great giveaway! I love all of these looks, Erika!! I think I need a plaid shirt!! I love that black off the shoulder!! Love all these cute fall pieces! Such cute fall clothes! I think I need that black off the shoulder top! Love all the clothes! Can't wait for fall weather! Thanks for posting so many cute outfits for fall! I am loving the side slit turtleneck! I'm in Maryland and the humidity has been crazy, so I'm still in tank tops and shorts! I love summer, but when fall finally arrives, it's going to feel good. Love all the clothes you shared! I would love a little extra spending money for fall/winter clothes-need new sweaters ASAP!! Yay, Erika! 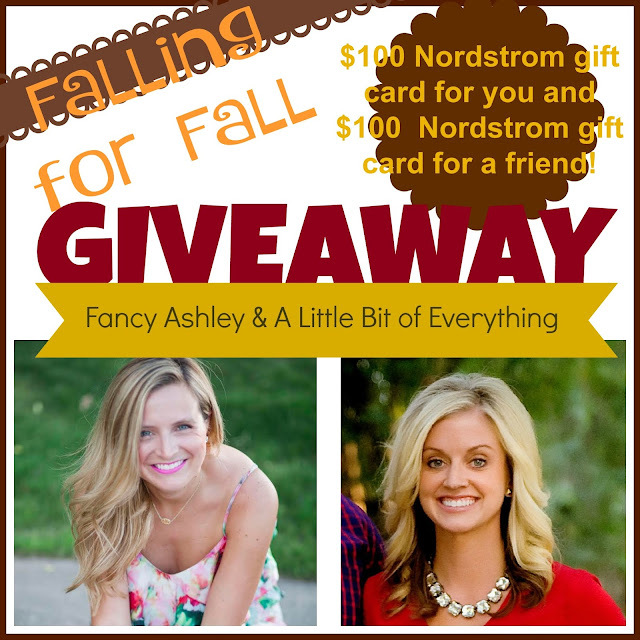 Loved partnering for this giveaway and I love all your fall faves! Lets hope the weather cools down soon! We are ready for you, fall! XO!! Love the outfits. Especially love the vests! Wahoo!! Fall! 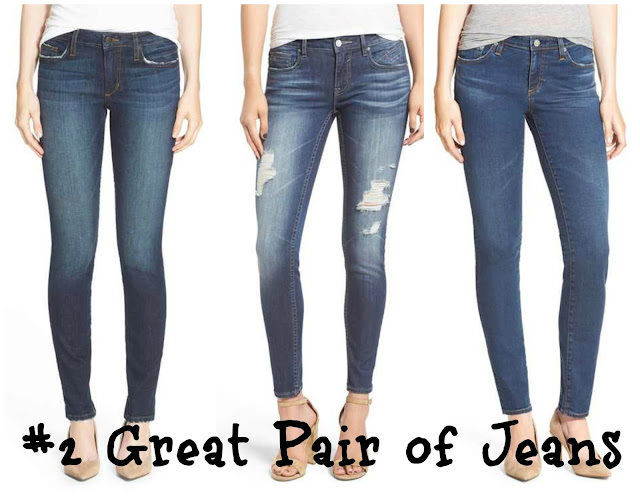 I'm going to check out the AG jeans. Thanks for the recommendations. Love all your picks for fall! Love that vest!! So stinking cute!! Love the white TopShop sweater! You are too cute! Fall clothes are the best. So cute and comfy. And boot weather is always a win. Time for bon fires and good fall candles. Would love to add some new things to my wardrobe for fall!!!! Great fall options! Can't wait to get some! I love your style! Your hair is fabulous! Would love a pair of booties with the Nordstrom gift card! Would love to win, I love so much of your picks! Love that vest and the beautiful flowy floral top! So cute! Oh I love those plaid vests! I may be ordering now! Loved this post and all of your fall fashion picks! You are too cute!! I live in San Antonio and definitely feel ya on this heat! So ready for cooler weather!! I am so ready for the weather to cool off too! Texas needs to get with the program! :) Such cute clothing pics! I love, love that white top on you!! You look fantastic! Thank you, also, for the giveaway! I think plaid is my go to in between piece. love the ones you picked up! I just need you to come dress me every morning!! But the gift card would help jump start my wardrobe!! I want the vest!! Looks so cute on you! 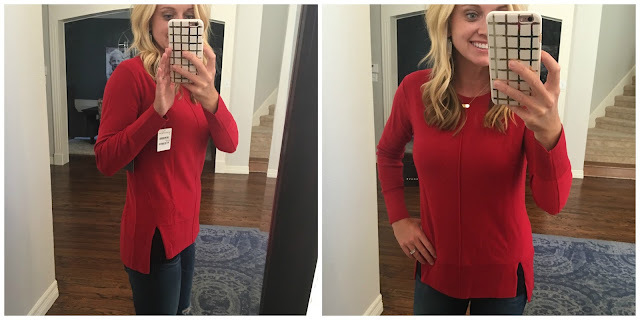 Seeing the post makes me really excited about fall outfit ideas! Great picks! Especially love a puffer vest and I love the green floral top. Wish the temperature would cooperate with us wanting it to be fall!! Awesome! I love fall and Nordstrom!! I love the turtleneck sweater! Would love to win thanks for the giveaway. I think I'm convinced I need those lucky brand booties. So precious! I'm always eyeing your picks for the long torso! Now I just need to decide on some lower heel booties! Such a fun giveaway! Just wanted to say how much I love the pic of Bowen and Ashby at the airport!!! Love fall booties! It's my favorite piece of my wardrobe when the fall season comes! Love fall clothes and love your picks! Love the mustard colored top! Being on that fall weather! Putting those AG jeans in my cart now! Love the Jessica Simpson booties...so comfortable! You are precious! That off he shoulder black too is speaking to me! Come on fall weather!! These outfits are so cute!! I love following you! You are adorable and I can say you have no worries if your tummy might show~ love all your picks for fall! Love the plaid shirt from J. Crew!! Fall clothes are my absolute favorite!! Fall just needs to get here in Kansas too! Your outfits scream fall! Love them. Hoping you get some fall weather soon! Love all the outfits! I need to go fall shopping now. Everything looks so cute on you. Love that waterfall cardigan it screams fall! Love your blog and your family. Great ideas and variety! Thank you! So ready for fall weather! Love all the fall looks!! Your style is so great!! And your hair -- post a blog on your styling secrets please! I need that football shirt for my Saturday outfit! Love these outfits!! I'm going to research all morning! I love Fall! Can't wait for the weather to change in PA! Love these outfits! I'm going to research all my options this morning! I'm a Texas girl living in a Colorado world now and it's so crazy to already be experiencing cool weather. It's like I still don't believe it enough to embrace all my fall clothes. But all of these clothes definitely makes me want to embrace it!! Dreaming of fall weather to go with fall clothes! We finally have fall weather here in Minnesota - my favorite season! I love your style! I need some new fall outfits and want everything you featured! Too bad my credit card won't like that!! Love the bootie options! I really needed some suggestions like those! Love the Jessica Simpson booties and the black top is so cute!!! Hope the weather cools down soon so you can enjoy all of your cute fall picks! Give me all the flannel shirts!! Love them all! So excited fall is here in Seattle!! Love the plaid!! Definitely fall in Nebraska as we are harvesting corn and jeans feel fabulous! Dying to get some new booties and sweaters! Michigan fall is so close! 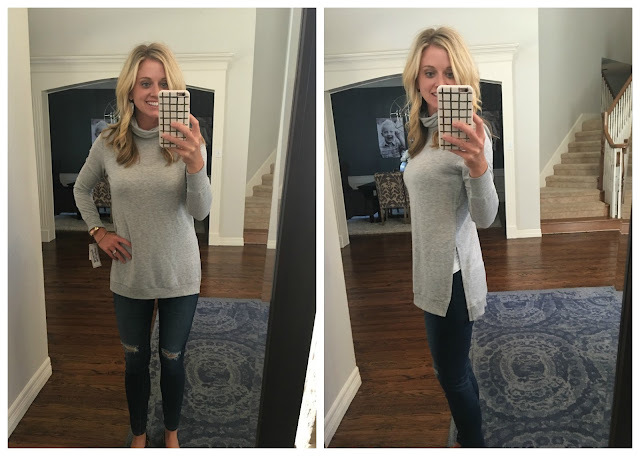 Cute looks for fall-- I LOVE that Lush twist front top! I have been eyeing it, and it needs to be in my life! I'm so excited Fall is coming! Love all these pieces! Let's talk about that plaid vest! Oh my heart!! Love all your fall picks!! Thanks for the chance to win! Love all your suggestions!!! Soooo ready for fall!! Loving your fall picks! Would love to treat myself to a couple of them! Thanks for the giveaway girls :) Love your fall picks. We are so ready for fall weather here in Nashville too! Esp being pregnant I am over this heat! thanks for this awesome giveaway! have a great weekend! Loving the booties, I keep trying them on and then chickening out thinking they will look silly and feeling like I can't quite style them right...this might be the year to take the plunge! That wine colored top! 😍 So need!!!! And I should probably get some new jeans as well! I'm loving all the fall fashion this year - its finally time for apple everything and plaid, booties, and scarves...oh my! If it ever gets cool here in S. Texas I hope to wear some of the fall tops and booties I have purchased! Love the Lush top and the fall vest! I am SO excited to bust out the booties, scarves, and ruffles! I would absolutely LOVE some spending money on new fall clothes! I love your fall pieces. Thanks for sharing! Love the giveaway! Definitely could use a pair of fringe booties and I have a serious love affair with puffer vests! This Californian girl is ready for some fall weather too! Best time of the year and best clothes of the year! Those booties are perfection. And I LOVE that white top. Great picks. Super cute finds!! Thanks for hosting the giveaway! !